TOTAL FLANKER...a rugby blog: Whatever happened to: Decisiveness? I used to be indecisive but now I’m not so sure. 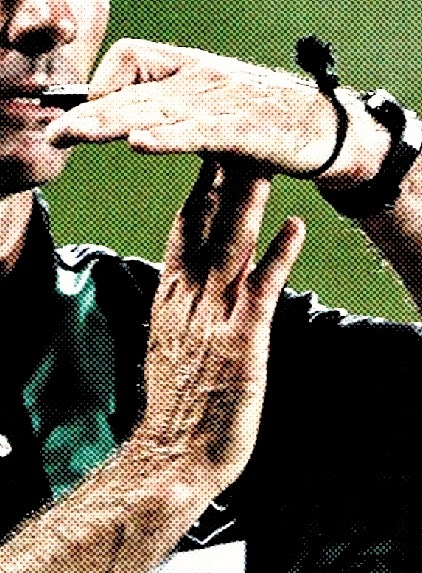 Once upon a time there was one bloke in charge on the rugby pitch – the referee. Players treated him with utmost respect and, whilst not always agreeing with him, accepted that his decision was the final word. Mistakes were made, yes, but they were accepted, for the most part, with good grace. And then along came the Television Match Official (TMO). Now, I have to admit that it used to be quite frustrating watching a game of rugby on TV and seeing a perfectly good try disallowed because the referee was unsighted – or vice versa – especially when it was fairly obvious that the official had resorted to guesswork. The arrival of the TMO was certainly a help (the odd baffling decision aside) for referees in this regard and the resultant break in play was usually quite brief and unobtrusive. The advent of the TMO turned out to be, however, the start of a very slippery slope. Nowadays it seems that every other decision is referred “upstairs”. Forward passes, potential foul play, whether a player is wearing the correct coloured underpants, all appears to be fair game for the TMO. Inarguably the referee’s authority has, as a result, become emasculated. Not only that, but the length of time being taken by the TMO to reach a decision, based on every TV angle imaginable, gets longer and longer. The way things are going, more and more decisions will be taken out of the hands of the beleaguered referee. How long will it be before games are monitored by a team of TMOs glued to TV screens with the referee merely being their mouthpiece on the ground? No, it’s time for the worm to turn and for decision-making power to be returned to the man in the middle. Some referees have already begun to swim against the tide in an attempt regain control, making up their own minds based on stadium screen replays rather than waiting an eternity for a TMO’s ruling. It's not perfect but it's a start. Decisiveness, it seems, might just be making a comeback. Flanker, hard to argue with this thesis. I agree that that match officials are afraid of making a mistake and are delegating their authority to the TMO-and it really is not fun for the viewer at home.